I hadn't heard of A United Kingdom prior to seeing the trailer, but I was instantly hooked after watching it. 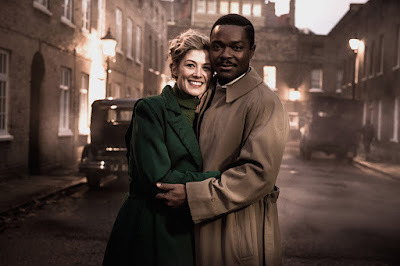 David Oyelowo and Rosamund Pike are two tremendous actors. Pike received an Oscar nomination for her role in Gone Girl, and Oyelowo was snubbed of a nomination for his portrayal of Martin Luther King Jr. in Selma. So, in my mind, the two are both Academy Award-level performers. Here, we have two excellent actors portraying a real-life story about racial tensions between two nations... that sounds like all the ingredients needed for the perfect stew. I was just concerned about the release date. This seemed like a film suited for an October or November release, closer to the Oscars. However, it came out at the end of February. So I had that reservation going in, but I was otherwise very much looking forward to it. And A United Kingdom didn't disappoint. It's exactly the movie you expect it to be, but not in a bad way, and is led by powerhouse performances. 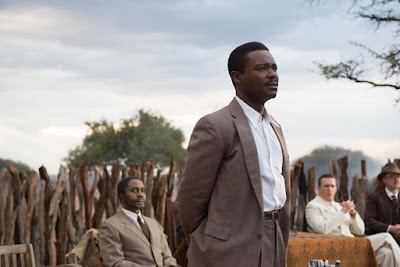 Seretse Khama (Oyelowo) is the rightful heir to the throne of the African nation of Botswana. But things fall apart when he meets a white English woman, Ruth (Pike), and marries her. As tensions between England and Botswana rise, the two try to conserve their marriage at all costs. I had never heard of this story, so it was fascinating to learn about it through the movie. What was interesting was that while the heart of the film was Oyelowo and Pike's relationship, it wasn't necessarily the focus of the movie. The first half features them falling in love and marrying, and the second half is about the political repercussions, and the Botswanans attempts to gain independence from the British. It's almost as if everyone in the film used the relationship as an excuse to act on tensions that had been building for years. So in that regard, I was surprised. And I think it was effective. While Oyelowo and Pike had tremendous chemistry, I don't think their relationship alone could have sustained the entire film. Exploring the larger repercussions and the politics of it, and using the relationship as a jumping-off point, was a genius way to keep this film engaging and intriguing, instead of just making it some Nicholas Sparks movie. The performances are also brilliant. David Oyelowo absolutely shines in this film. I think he was ultimately better in Selma, but he turns in an A-grade performance that unfortunately is being overlooked. I do think Oyelowo outshined Pike, but she was still very good. The two had excellent chemistry, and worked beautifully together on screen. I also thought the direction was spectacular. I haven't heard of Amma Asante before, but I'll definitely keep my eye out for her now. I do think the story was a little conventional. It was a standard biopic, and it didn't do much to stray away from that traditional format. I know that they're just working with what they're given, but there could've been more done to make it stand out. The pacing also wasn't perfect. There were some parts when I was absolutely riveted, and other points when I was kind of looking around and checking the time. It did drag at times. It also was a little bit too long. I think about ten to fifteen minutes could've been shaved off to make it a leaner and tighter film. I also think this movie was doomed immediately when it was scheduled for a late February release date. I don't think it would've had any presence in this years Academy Awards, but putting it out in November or something along those lines would have given it an extra boost. It's only made about a million domestically, and that's sad because this is a very good film. I think many people stayed away from it because they thought it wasn't going to be any good. Had it come out closer to the Oscar season, I think more people would've seen it, and it's a film that absolutely deserves to be seen. Overall, A United Kingdom is a very good film. It's an important story that I hadn't heard of before, and was interesting to watch unfold on screen. It touches on racial issues in an adequate way, though it's nothing that hasn't been done before. The film is really led by David Oyelowo's powerhouse performance. He does outshine Rosamund Pike, who is the Oscar nominee of the two. She's very good in it, but lives throughout the film in the shadow of Oyelowo. The two do have excellent chemistry, however. The direction by Amma Asante is great. The production design and the costumes also stand out as being very good. The film is a bit traditional, and is exactly what you expect it to be. It doesn't do much to stray from the paint-by-the-numbers biopic formula. Most of the time it ends up working, but a little bit of differentiation would've helped to make it stand out. The film also drags at points, and is a bit too long. It also suffers from being released at a very strange part of the year, as a release date closer to the Oscars could've definitely boosted its box office and gained attention. 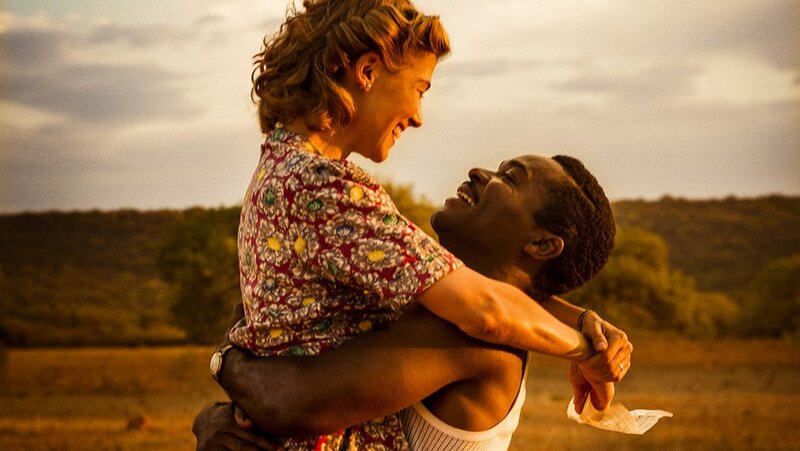 In the end, A United Kingdom tells an important story well, and is a great showcase of the range of David Oyelowo's acting abilities. What do you think? Have you seen A United Kingdom? Did you like the film? Leave your (spoiler-free) thoughts in the comments section below.